There is a certain distance to travel when writing about dance; can one write as much as one sees, feels, and hears? It is not easy to grasp the totality of any particular dance piece or (even more so) an entire festival. The festival’s program notes, however, are superbly crafted to offer a nuanced sense of each work as well as how they intersect along similar themes related to identity, culture, and space. What is left behind after the dancing ends? What echoes? What resonates? What (still) moves? For me, it’s not the quality of the dancing, which was piercingly composed and executed. It’s not the superb music that accompanied each piece. And it’s not the creative use of spaces in, outside of, and across from the ODC Theater. For me, what echoes days after ODC Theater Director Christy Bolingbroke’s artfully curated evenings of dance on Friday and Saturday nights (Programs A and C) is the clever interplay between words and dance. 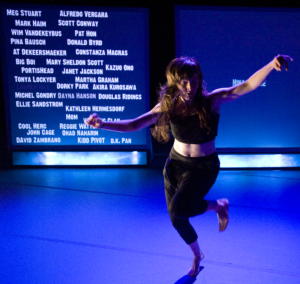 Words matter and names can matter even more as evidenced in Lionel Popkin’s Ruth Doesn’t Live Here Anymore and Amy O’Neal’s The Most Innovative, Daring, and Original Piece of Dance/Performance You Will See This Decade. Popkin’s piece emerges out of extensive research on Ruth St. Denis, especially her journals. 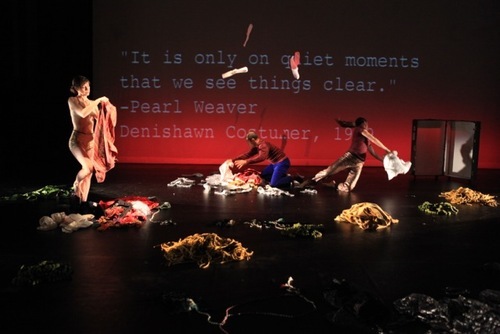 And in her program notes, O’Neal describes her piece as an “essay.” Beyond these textual preliminaries, both choreographers use words to help bridge the distance between dance, music, and video – words become a part of how ideas and questions are expressed, a part of the movement on stage. In these two dances, words are not merely accessories to prop up choreographic meaning; they are fundamental to how Popkin and O’Neal move thought, how they think. What grabbed my attention in particular was how each piece used names that opened up fissures of meaning, leaving me to wonder how to connect the dots between now and later, past and present. At the beginning of Ruth, three dancers roll in a line on the floor (and over each other) as the names of Ruth St. Denis are displayed above on a screen also in a line. These names mirror different moments in Denis’ life (birth, marriage, stage) while also pointing to shifts in identification and changes of circumstance. There is a certain humor as well as solemnity in this seemingly endless ticker tape of names and the continuous rolling of bodies on the floor below. This kind of inter-word play between wit and gravity is a dominant feature throughout the 30- minute excerpt. The naming and names of Ruth St. Denis, however, are particularly striking. This part of the dance opens up a field of inquiry about our struggles to discover who we are and what defines us over time. Denis, it seems, is not quite past; she has more to teach us about how to move. The Most Innovative, also an excerpt of a longer work, incorporates movement, words, and video, to ask about the difference between power and empowerment, the struggle to find creative voice, and the irritability of sexualized and gendered bodies. At the end of the piece, O’Neal projects the names of people – relatives, teachers, dancers, choreographers, musicians, DJs – that have influenced her work. This multitude of names suggests that making (i.e. choreographing) is an ongoing process of layering, or sampling. This visual weight is underscored by the movement sequence of O’Neal’s final solo (“Exhibit H”) that is both punctuated and soft, a refreshing mix of sensibility and form. This ending also opens up a field of inquiry about how the names we carry with us are woven into the fabric of who we are struggling to become as artists or otherwise – are we truly more than just the sum of our parts, past or present? The bringing together of words and movement on stage is not new, but the ways Popkin and O’Neal entwine them left me wondering – how do words move? Both Popkin and O’Neal offer some answers. One possible way that words move is to expose gaps of meaning. O’Neal highlights the distance between power and empowerment by first asking what is the difference between them and then dancing a “strip-tease” to a cover of Money Changes Everything. By mixing up words with moves, power and empowerment move not as definitions, but as questions or doubts. Words also move by playing with our sense of time. Popkin’s piece relies heavily on Denis’s choreographic notes, her words, to create movement. These past words are not stagnant, but alive as they are mixed into the present in new ways, shortening distance between old and new. Thus, the fissures created by the mixing of words and movement cultivate more, or less distance. Both dances use words to move between past, present, and future, and between different ways of being or becoming. In the end, Ruth and The Most Innovative suggest that this mixing of words and bodies is a mode of cultivation, a process of micro and macro articulation, which can bring us closer to distant pasts and future paths. And yet, I still wonder. How do these works participate in conversations outside of the theater? How can they help bridge distances between where we are now and where we want to be? Can these dances help find new ways of thinking about issues related to artistic creation, gendered culture, and political power? Such questions don’t have easy answers, but I am happy to be left wondering, and I look forward to more.